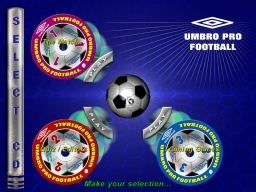 Umbro Pro Football was a promotional game developed on behalf of Staggan Ltd. for Nestlé Cereals, married with the Umbro brand of sportswear. 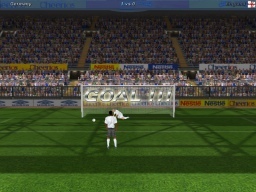 The game itself spanned 3 CD’s, each being collectable from the packets of cereal, and each being a standalone section of the entire “game” that could be installed in any order to form an entire product. 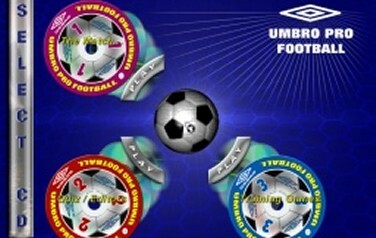 After evaluating several ‘free’ or cheap game engines – we built UPF with the Cipher Engine, a bargain at only $100 USD! 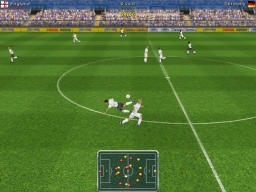 CD1 provided the main football part of the game, and allowed Quick Match and League play against computer controlled teams. 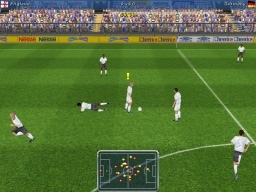 It is a straightforward 11 a side football game. 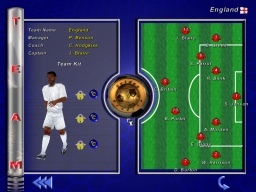 CD2 provided a 100 question football trivia quiz, answering the questions correctly earns Golden Ball credits, which can be used to unlock features within the team and player editor allowing the gamer to customise teams & player skills. 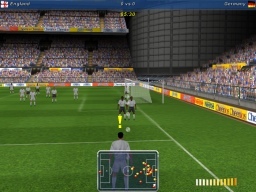 Finally, CD3 added three minigames to the whole package, allowing the gamer to practise certain set-pieces, being Penalties, Corners & Freekicks. This page is hosted for the benefit of the following who all contributed to UPF… together we managed to push out an overscoped 9 month project in 6 months, just… and although it played a bit naff, it looked damned fine for a “freebie” game.